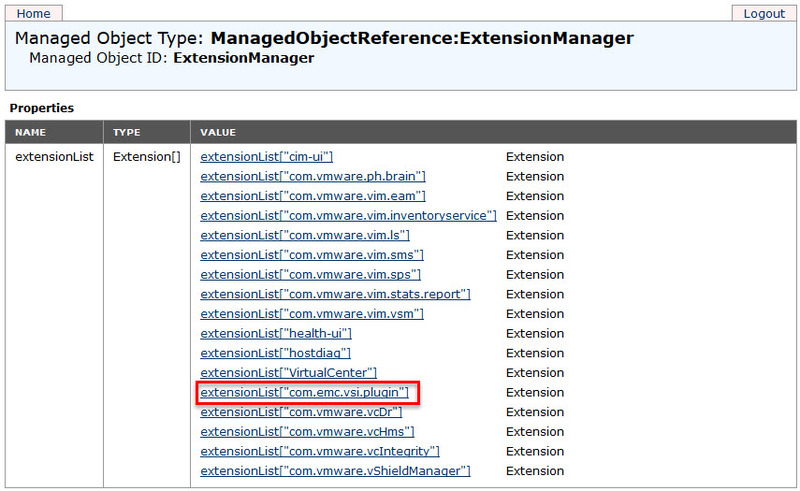 When using third-party management products for vCenter Server, these plug-ins appear in the Available Plug-ins list. Some of these products may not have an uninstaller to remove the entry under Available Plug-ins or have been deleted/uninstalled before the plug-in was unregistered from vCenter. For example, we ran a PoC for vFabric Data Director in the test environment some time ago but somehow managed to delete the vFDD vApp before unconfiguring and uninstalling it properly. It would not be an issue but it appeared that ALL VMs in that test environment fell under the vFDD radar management (My guess is that the whole cluster was selected during System Resource Bundle configuration…). VMware KB article 1025360 “Removing unwanted plug-ins from vCenter Server” describes this procedure in details. 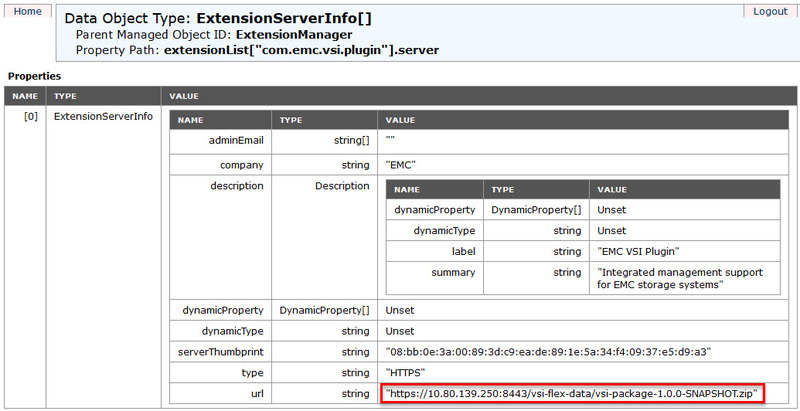 For the purpose of this blog post I will be removing vFabric Data Director and EMC VSI (Virtual Storage Integrator) Plug-Ins. In a web browser, navigate to http://vCenter_Server_name_or_IP/mob. Where vCenter_Server_name_or_IP is the name of your vCenter Server or its IP address. Select and copy the name of the plug-in you want to remove from the list of values under Properties. For a list of default plug-ins, see the Additional Information section of VMware KB article 1025360 “Removing unwanted plug-ins from vCenter Server”. 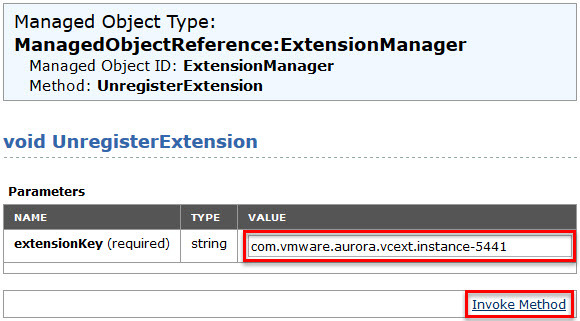 The vFDD’s codename is “Project Aurora“! BTW, if you click on the extension link, you will get Plug-In properties. The ‘lastHeartbeatTime‘ tells you when it was used last time. The ‘server‘ shows the connection URL details – very useful for troubleshooting. Scroll down the page and click UnregisterExtension. A new window appears. Refresh the Managed Object Type: ManagedObjectReference:ExtensionManager window to verify that the plug-in is removed successfully. Restart vCenter Web Client service. Note: If the plug-in still appears, you may have to restart the vSphere Client. If you have vCenter Server in linked mode, perform this procedure on the vCenter Server that is used to install the plug-in initially, then restart the vCenter Server services on the linked vCenter Server. 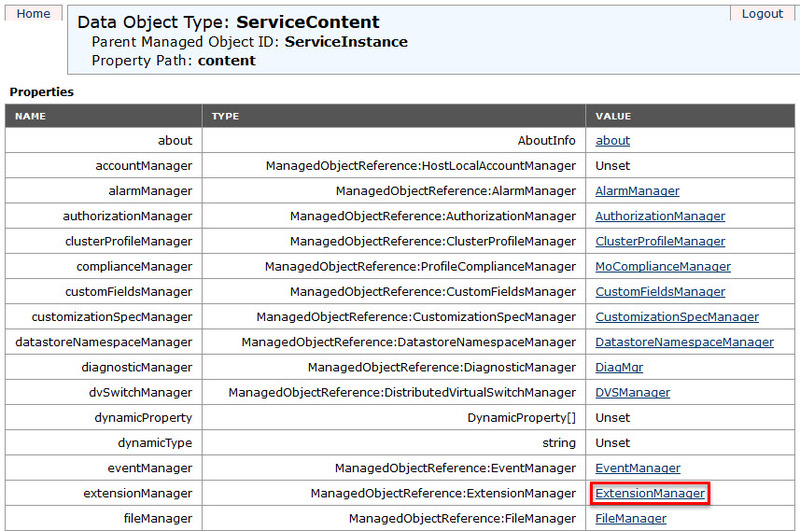 Power VM off, remove it from vCenter Inventory and add it back again.